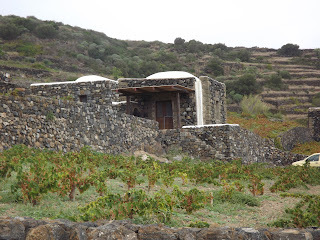 Tracy and I woke up in our little stone house on the property of the Donnafugata Winery on the island of Pantelleria. We would be traveling again this day, but first we were able to tour this beautiful property and see a bit more of this Sicilian Island. Antonio Ralla, one of the owners of Donnafugata, and Marta, from the marketing department, met us at the cellar to talk about Moscato de Alexandria and the vineyard built on volcanic soil, with sand and light pumice stones. We also discussed the Arab influence on the island (Tunisia is only 20 miles away). The vineyard was filled with Moscato grapes drying on the vines. Marta took us through and along the way we picked some to eat and they were juicy and sweet. 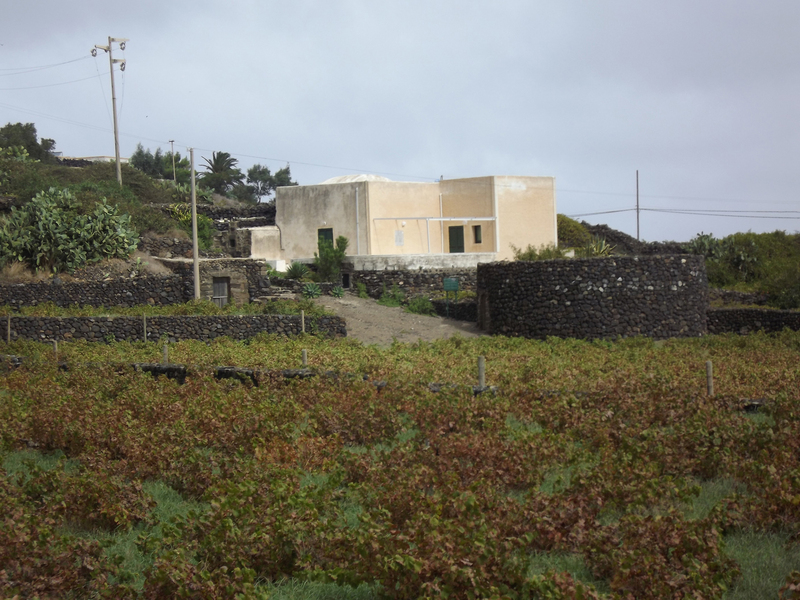 She then showed us the Giardino Pantesco (a fortress for a tree) Donnafugata. It is one of the most unusual gardens in the world, with an orange tree growing inside a stone wall. The original concept goes back 3,000 years and the winery has kept it going. 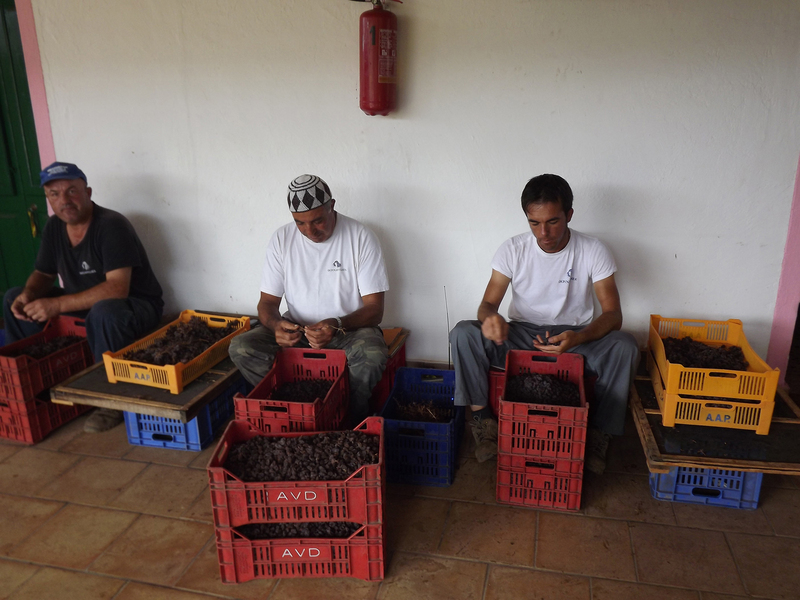 We went to meet the grape pickers and watched them take the stems off for the tasty raisins that will go into the wine. The Moscato here goes through a soft press, maturation, fermentation and vinification three times – with the dried grapes added to one. No barrels are used in the process so the Moscato always retains the fruitiness. 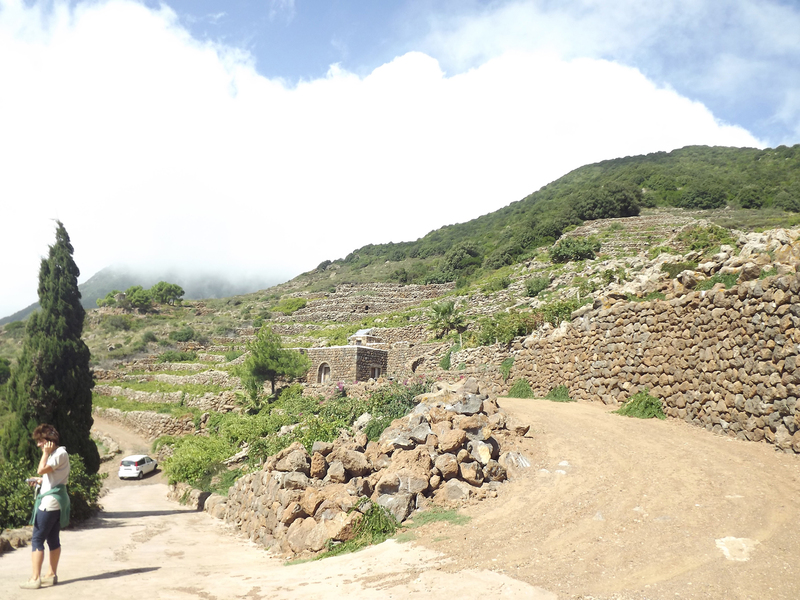 Before lunch we took a drive up to a mountain which had capers growing up the slope. 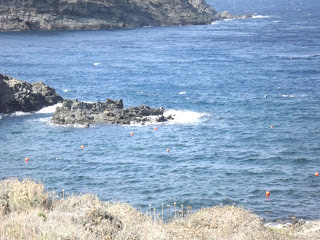 I had never seen anything like it, but apparently this system had worked so well over the years the island became famous for capers. We then had lunch with the men in the dining hall where they had all their meals each day they worked. Tracy and I sat with Antonio and Marta for eggplant, pasta, steak, melon and pastry, sipping the Nerodiablo, an excellent blend that includes a bit of cabernet sauvignon. After lunch we went for another ride. We were able to get some more breathtaking views of the Mediterranean from on top of the mountain at one of the other Donnafugata vineyards. 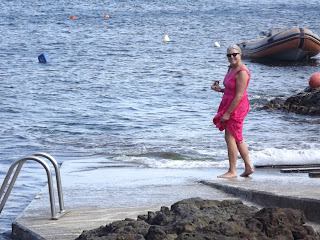 Before we went to the airport we spent some time relaxing and wading our feet in the water at Cala Gadir Pier and also got to take a look (from the outside) at the Giorgio Armani compound here. 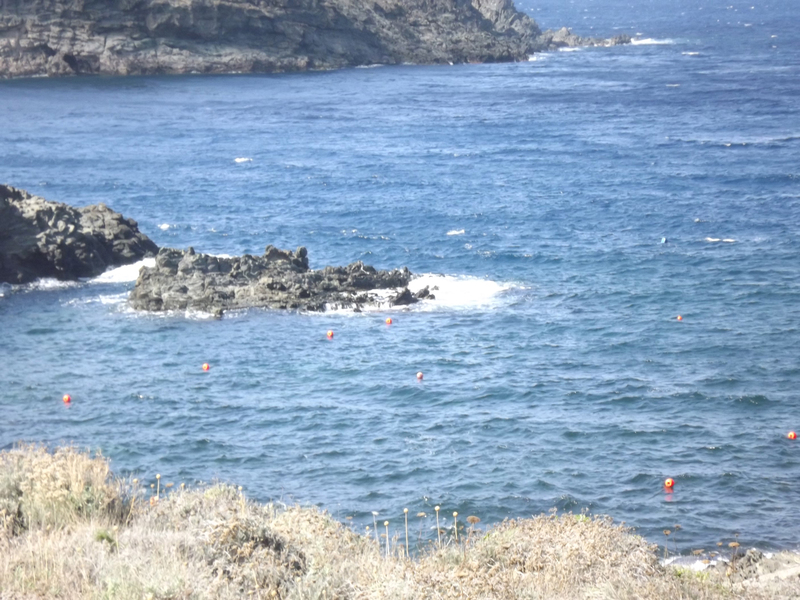 We took a short flight with Antonio and Marta to Trapani in mainland Sicily. 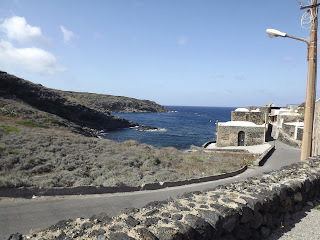 We were soon at a wonderful hotel, Hotel Carmine, where we had just a short while to see the rooms and change for dinner with Antonio’s sister and the other owner of Donnafugata, José Rallo. Jose, who manages to have it all, helps run the winery, spend time with her family and is even an accomplished singer! Most of all, she was great company and Tracy and I thoroughly enjoyed our dinner at Bucanieri, where the chef/owner created a meal just for us after we told him what we liked. We chatted and sipped the lemony light Anthilipa with a grilled cheese in a sweet grape sauce. It was like nothing I had before – simple, yet very satisfying. It was followed by an eggplant appetizer, which the chef had cooked four hours to tender perfection. 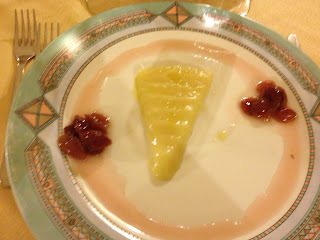 We had that with yet another Donnafugata wine, the buttery Chiaranda. The arancini (rice ball) was just wonderful, as was the freshly made pasta served with salted (not too much) ricotta and a pommedora fresca sauce. 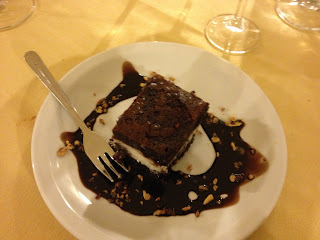 The meal finished with a scrumptious chocolate ricotta cake covered in fudge sauce, served with what had become one of my favorite wines, Kabir Moscato. 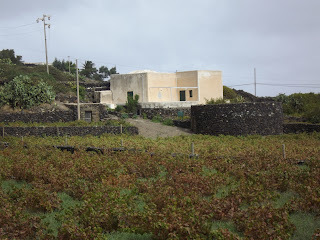 Jose took us back to the hotel for a good night sleep before we explored Marsala and more Donnafugata.